Last August, a terrorist attack targeting a Hindu shrine/tourist attraction in Bangkok killed 20 people. The investigation into that attack seems to have settled on a pair of Uyghur men, though it should be stressed that both insist they weren’t involved and Thailand is currently being run by an unaccountable military junta whose respect for human rights and the rule of law is questionable to say the least. One prevailing theory seems to be that the bombing was perpetrated by the Grey Wolves, a Turkic nationalist militia affiliated with Turkey’s ultra-right wing Nationalist Movement Party (MHP), in retaliation for the Thai government’s policy of deporting Uyghurs who are wanted by Chinese authorities back to China, instead of allowing them to seek asylum in Turkey. At least four people were killed and dozens wounded when a series of bombs went off in areas popular with tourists across Thailand over the last 24 hours, according to media reports. At least four of the blasts occurred in the beach resort of Hua Hin, about 120 miles southwest of the capital Bangkok, on Thursday and Friday. A street vendor was killed and about 20 people wounded, some of them tourists from Britain, Germany, Italy, Austria and the Netherlands, in two of the bombings Thursday, officials said. Police chief Pol Col Sutthichai Srisopacharoenrat told the Bangkok Post that the dead woman was selling food in front of a bar when the explosion happened Thursday. Two more bombs went off in Hua Hin Friday morning, killing one person and wounding four, the Associated Press reported. 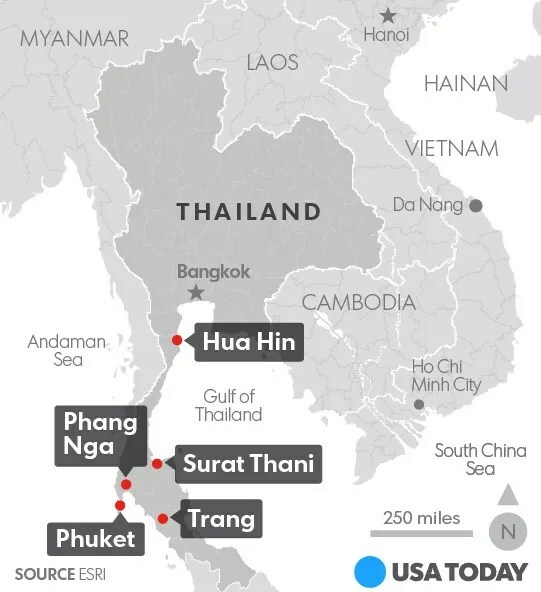 Other bombs also went off in Patong Beach in the southern resort of Phuket and in the southern provinces of Trang — killing one person Thursday; Surat Thani — where one person died Friday morning; and Phang Nga. Several explosions went off in Phuket on Friday, the BBC reported. Despite the timing, it doesn’t seem like any of this week’s attacks were connected to the Uyghur issue and/or the Grey Wolves, and Thai authorities appear at this point to be ruling out any connection to “international terrorism,” however you want to define that. It’s not even clear that the bombings are connected to each other at this point, though it would be quite a coincidence if at least some of them weren’t connected. None of the bombs was particularly large, and while many of them targeted places frequented by tourists, several of those seem to have gone off at times (early morning, for example) when there wouldn’t be many tourists milling about. So what’s going on? Thai citizens did just vote last weekend to adopt a new constitution backed by the ruling military junta, a step toward maybe restoring the country to civilian control–though the junta didn’t allow much in the way of open debate or campaigning against the constitution, so the legitimacy of the result is iffy. It’s possible these bombings were motivated by resistance to the junta. But, again, there’s no solid evidence yet to link these bombs to the outcome of that vote. Yesterday also happened to be the Queen of Thailand’s birthday, for whatever that might be worth. Another possibility is that the bombings were linked to the insurgency that has been ongoing in the predominantly Malay Patani region, in the southernmost part of the country, since the middle of last century. The types of explosives used seem to point to a connection there, but again that’s still not hard evidence. And there’s always the possibility of a FALSE FLAG!!!!11!!1! operation, whereby the junta planted the bombs themselves in order to scare everybody into tamping down internal dissent. Or maybe some of the bombings had to do with one thing and others with something else, and they all just happened to occur within a day of each other. What a chaotic situation. Al Jazeera is reporting that two men have been taken into custody related to the bombings, but there don’t seem to be many details beyond that.